Weddings Costs > How Much Does Wedding Draping Cost? How Much Does Wedding Draping Cost? Wedding drapery refers to the large white drapes or curtains that can be hung in different ways around the site of the wedding, effectively transforming an otherwise plain space into an enchanting venue. 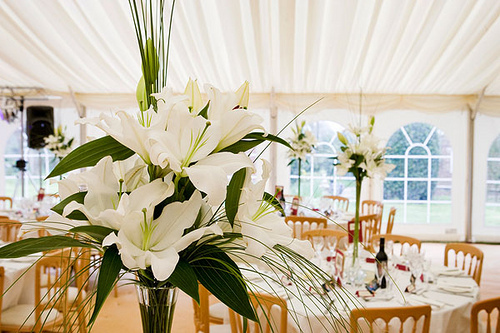 How much does draping cost for a wedding? Depending on the setup, the size of the reception room and the number of drapes you need, the price for a professional to hang wedding drapes is going to range anywhere from as little as $300 to as much as $4,000 for most jobs. Most prices, however, are going to be in that $400 to $900 range. Common rooms, in this price range, will cover about 100 feet. If the company charges by the drape, then plan on spending around $125 to $250 each. By the yard, it will be about $2 to $4, and if by the linear foot, it can be closer to $5. Eventprotraining.com, for example, charges $2 per yard for a voile fabric to drape the ceiling. But if you want this event planner to do the whole ceiling for your venue, it can cost around $2,500 for the average venue size. A forum poster on this WeddingBee.com forum thread claimed they received a bill for $1,160 for four drapes of fabric and four strings of lights. The height of the ceiling is often the main factor, but keep in mind most wedding drape rental companies can only accommodate sizes up to 14 feet. While some can provide larger sizes, it’s rare, according to brides online. Like the height, how much of the room are you looking to drape? If the wall is 100 feet long, then you will need 100 feet worth of drapes. If you were to want a full appeal, then you will want to double this amount. All fabric won’t be created equally. If you want a different color option or a heavier-type fabric, then the prices can increase. Set up charges can fluctuate depending on the travel distance and the number of staff required to perform the job. Most professionals will travel to a location within 25 miles. Anything over this often incurs an additional mileage charge. If you are going to hire professional, the estimates noted above typically includes the materials, poles and/or LED lighting. The estimates should include delivery, setup, taxes and take down. Drapes will often be used around the ballroom, the ceiling, the column covers and around the door. Aside from the drapes, many companies will also include LED projectors to illuminate the drapes with the client’s preferred colors. In some instances when the event service provider is located more than 30 miles away from the wedding venue, you will be required to pay for the travel cost. As mentioned above, some companies will include LED projectors while others will not. If they don’t include it in their estimates, then the projector will cost around $50 to $100 each. These projectors, if you wanted it, could project lights, words, or even pictures. Other lighting features such as chandeliers can be added for an additional fee. There can also be strings of lights throughout the drapes that are hung. Pinterest.com is a great place to browse through drapery pictures at various venues if you need ideas. On average, it’s a lot cheaper if you pick up the items you need from the service provider and do the drape installation yourself. This is not as hard as you think. Eventprotraining.com, for example, has a helpful video on how the process is done. Some venues may include additional premium add-ons, such as draping, inside your venue reservation fee. Talk with the venue you’re working with to see if they offer something such as this.